Charlie Wilson's War is an enormously entertaining and informative history of the secret war that put the final nail in the Soviet coffin, leaving behind a vacuum into which stepped the Taliban and Al Queda. This is a truly great narrative of how we arrived in this post Cold War world with it's new terrorist wars. This book is a complex story which will grab your attention and keep it. After reading or listening to it you will have a much better insight into why we are where we are today in the Middle East. You will also learn that Ronald Reagan DIDN'T defeat the Russians (much to my disappointment, since I am a Reagan supporter)despite what anyone says. You will learn how our government REALLY works, particularly Congress. Trading favors regardless of political party or whether your representativr is a conservative or a liberal. You will learn more about why the CIA wasn't there when 9/11 occurred than you ever will from the sanitized 9/11 Commission Report. You will learn that Reagan bet on the wrong horse (Nicaragua amd the Contras) to beat the Russians while the long shot (the Afghans and Pakistan) won the race and toppled the Russians with the help of a Texas Democrat who was everything that Muslims hate about America, a drunken womanizer. His fight to unite Pakistanis, Afghans, Israelis, Saudis, Egyptians, Swiss and more into one of the most rag-tag coalitions in history all in the single goal of defeating and destroying the Red Giant. And succeeding better than anyone could have imagined. When you read or listen to this book you will not believe your eyes or ears. You will not regret the time you spend with this vook but if you don't read it, you will miss one of the most straightforward honestly written books ever. Having read thousands of books in my life, this is something I have never said about any other book I have ever read. IT will really open ypur eyes, no matter what your political beliefs may be. I know that I will be recommending it to all of my friends and relatives, which is something else I never do. The editor's synopsis makes this book seem like a dry account of one of the many battles of the cold war. In reality, this book is about a number of things: the inner workings and culture of the CIA and US Congress, the comical account of an "upwardly failing" alcoholic congressman, the incredible backdoor dealings of millionaire Texas socialites and foreign military dictators and lobbyists. I was absolutely captivated from beginning to end. I listened to this during the course of two roadtrips and would actually reduce my car speed so I could finish the book more quickly. There is a reason why this book is among the most popular books on Audible. You won't regret reading it -- while it is a non-fiction book, the story reads like complete fiction. You'll love it. This book was well written but has so much detail it becomes boring after the second part. I felt I was reading the same material in a different city or country. The description was the same-I did not finish it which is rare for me. I could not recommend this book. Many people have commented favourably about this book and I will throw my hat into the ring in this regard. Growing up I never learned anything about Afganistan and the Soviet occupation--if anything, my knowledge of this era was formed by watching Rambo III. Now, not to discredit the Rambo franchiase, but providing an accurate historical accounts is not Sly's strength. 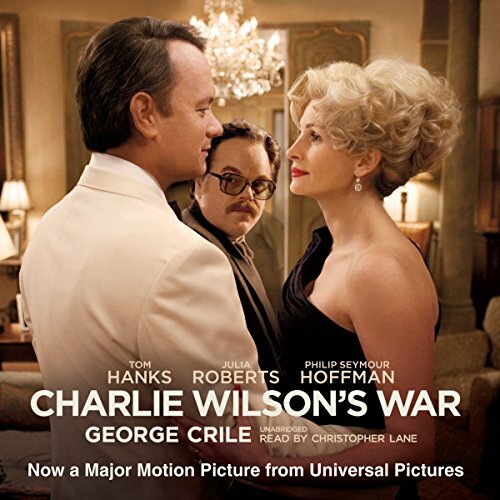 Charlie Wilson's War is a great introduction to this whole topic. It gives a compelling snapshot of Afganistan, the CIA, the Soviet occupation and the root causes of Islamic fundamentalism in Afganistan and how this was the root cause of 9/11. Essentially, the book makes the point that the CIA's covert war in Afganistan planted the seeds for the 9/11 attacks. The audio book is perfectly narrated, has compelling characters, and is much much more informative than the movie of the same name. I watched the movie before reading the book, and purchased the book becuase I had the sense that there was so much detail cut out to fit the book into a 95 minute Hollywood film. The best thing about this book is the sheer research that must have gone into it. The research is understated, but the comments the author collects from the players in this drama and then weaves into the book is impressive. Highly recommended--no doubt in my top 5 of Audible listens. I started listening to this book, and then watched the movie part way through. I was really disappointed with the two-dimensional feel of the film versus the exposition of the various characters in the book. It's rare to really get to know characters in a non-fiction book... it's often too much about what happens, not who makes it happen. You will not find that with "Charlie Wilson's War." If you really want to know what happened in Afghanistan during the end of the Cold War and want to be seriously entertained and hooked into the characters of the true-to-life story, this one is for you. Totally captivating. This was one that I couldn't put down...or turn off. Excellent story and fantastically read. Superb character development contributed greatly to the context of the story. Worth listening to again and again. This book gives a very detailed explaination of one way that the Congress works with, or how it can work around the rest of the federal government. I strongly encourage others to read or listen to this book, and I look forward to seeing Tom Hank's representation of Charlie in the movie. Not only a good story, but perhaps more important, it educates people on how Washington works, i.e. with a little moxie and chutzpah, you don't need to have permission to change policy and give away billions of taxpayer money without oversight. I listen to 3-4 books a week on average. While I like to mix nonfiction with the fiction that keeps me entertained, often nonfiction is written too pedantically to keep my attention. Not this book. Good to the last drop. One of those books you wish would keep on going.